Care should be taken to hang artwork in an area where it will not become damaged by heat, ultra-violet light or humidity. Hang your artwork out of the line of direct sunlight. In sunny environments, or in areas that are lit with fluorescent lighting, conservation UV filtering glass is available from your picture framer and is essential for valuable artworks! Never hang your valuable artwork over a heat source or in an area that will be high in humidity (such as a steamy bathroom). Correct lighting for pictures and artwork is essential to achieve maximum viewing pleasure. Spot lighting each piece of art will create a fabulous effect tand will truly bring your artwork to life. Many methods to add lighting to your pictures can required a licensed electrician to install. However, a popular way to bring essential lighting to your art is to use accessories like the Gallery System Lighting Wands. These very easy to install, low voltage light wands can dramatically enhance the overall aesthetics of the room that the artwork is displayed in and the artwork itself. The main room lights can be left off and then the gallery system lighting creates beautiful pools of light just where you need and an awesome designer effect. For the best effect and viewing pleasure your artwork and pictures should be hung at the eye-level of the average person in the room. If you are hanging pictures in a room where more time is spent seated than standing, eye-level should be lower. You should always avoid hanging picture too high! Hang smaller, more detailed pictures in small spaces such as hallways and corridors, where impact is less important than content. These places are also good for when the artwork is best enjoyed up close. Larger, ‘atmospheric’ art and big pictures require more room to enable the viewer to stand back, appreciate and enjoy. Hanging larger pictures opposite the entrance to a room or at the end of a corridor will provide much more impact and the art becomes a fabulous statement to compliment to your furnishings and overall interior design. Unless you are striving for an eclectic antique shop look, groupings of pictures should look as though they belong together. Select frame styles that are compatible and matting styles that will work well together and create a balanced, unified look to the group as a whole. Spacing of your pictures is also an important element in picture grouping. Each picture should be placed not too far from nor too close to each other. The most commonly recommended way to create balance in a picture grouping is to lay the entire layout on the floor. This will allow you to get a sense of how the pictures will look together on the wall, allowing for adjustments and accurate measurements. Also you should align the top or bottom of the various pictures in the group. This acurate placement is critical and very easily achieved with our Picture Hanging System. 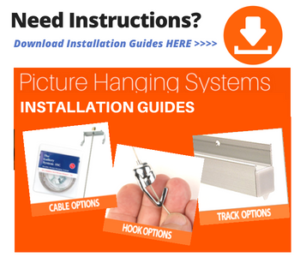 Ensure you use professional hardware and a proven Picture Hanging System. Using nails, screws and stick on hooks is not only hard work but will often leave walls damaged. Old fashioned methods of hanging pictures also make it very awkward should you decide to reposition your artworks. 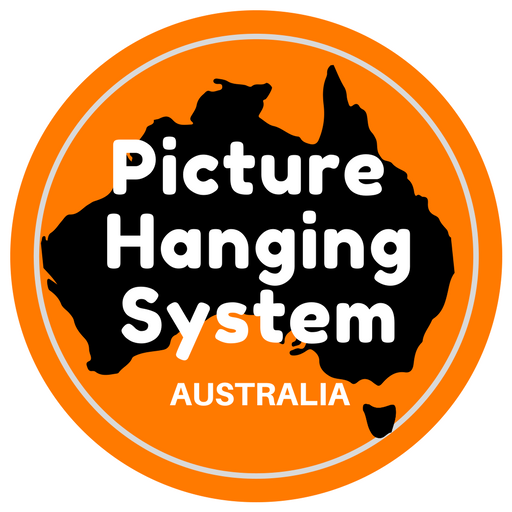 Picture hanging systems make a lot of sense and hanging pictures in the correct place a breeze as easy adjustments and fine tuning can be made at any time. You can also hang several pictures together on the system to achieve a popular grouping effect. The load and number of pictures that can be placed on the Picture Hanging System is determined by the number of hanging rail fixings that you create at the time of installation and, of course, the material of the wall itself. Correct application and screws should be used dependent upon whether you are fixing the rails to plasterboard, timber studs, or plaster. Consult your local hardware store for proper advise if you are unsure. When hung correctly, you will be able to sit back and enjoy your artwork display for many years to come!